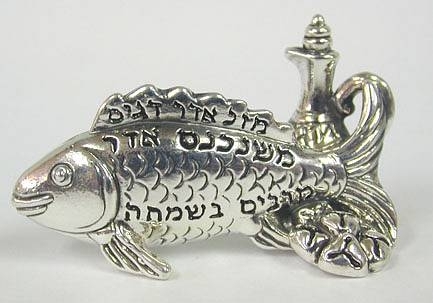 Beautifully designed as an highly detailed fish with a wine decanter next to its tail.Inscribed in Hebrew "Mazal Adar Dagim" and "MeShnichnas Adar Marbim B´Shimcha".Inscribed in Hebrew "Mazal Adar Dagim" and "MeShnichnas Adar Marbim B´Shimcha".This item was made in the electroforming method. Height: 1.2in. / 3.048cm.Length: 1in. / 2.54cm.Width: 2in. / 5.08cm.Weight: 12gr. / 0.386oz. 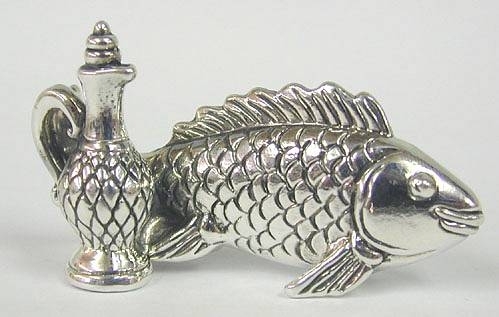 925 for sterling silver.